Submarine movies are great. 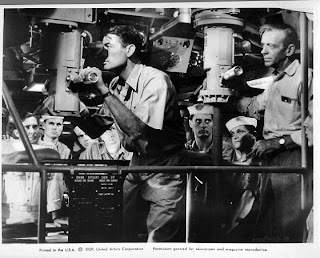 You can always expect your fair quota of "Up Periscope", "Dive! Dive! ", "Fire One!" and "Rig for depth charges!" In every sub movie there's almost always a tin can chasing the sub scene, with those wonderful miniature shots of depth charges exploding next to the sub. 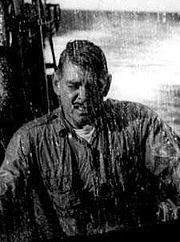 (Cut to interior of sub - the sailors are thrown from one side of the boat to the other, a pipe bursts, lights go out, sailors turn a valve off to stop the leak. Ninety percent of submarine movies are total cliche, but I love them and get sucked in every time. Even though Das Boot is probably the "best" submarine movie ever, my favorite is still Destination Tokyo. With that big name cast and the great Warner Brothers stock company to support, it's hard to miss. Plus, there is something about the wartime propaganda movies that I really love. I'm a sucker for POW movies too. I hope you do an article on those someday. Yum-o on the pictures!!! 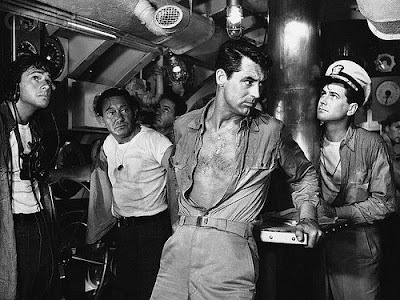 I agree, I am not a fan of war films, but a good submarine film seems different from the war genre. I always love them and I am not sure why. 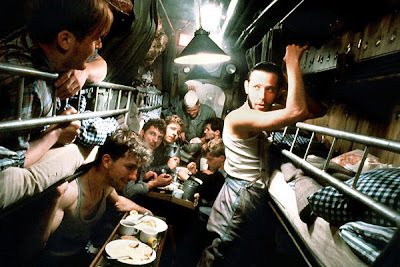 Sadly, I have never seen Das Boot so I must check that submarine goodness out. Hi, love the post. I'm a big fan of submarine films, Das Boot being my favourite of all time with K-19: The Widowmaker running a close second. Though Harrison Ford was class in it.